How do you unwind after a long day of work? Most likely, by kicking up your feet in front of the television in your comfiest clothes after whipping up your favorite cocktail. It's a fun way to relax and it never fails to rejuvenate, but perhaps you'd like to spice your after-work routine up a bit? If so, pick up the Joker and Harley Quinn ice cube tray so you can turn your yummy-but-basic adult beverage into a comic book inspired devious drink. Simply plop a few ice cubes in your drink and get ready to unwind like the villainous twosome. The officially licensed, hand-wash only ice cube tray makes 9 ice cubes in the shape of The Joker and Harley Quinn's face with some "HAHA's" thrown in. 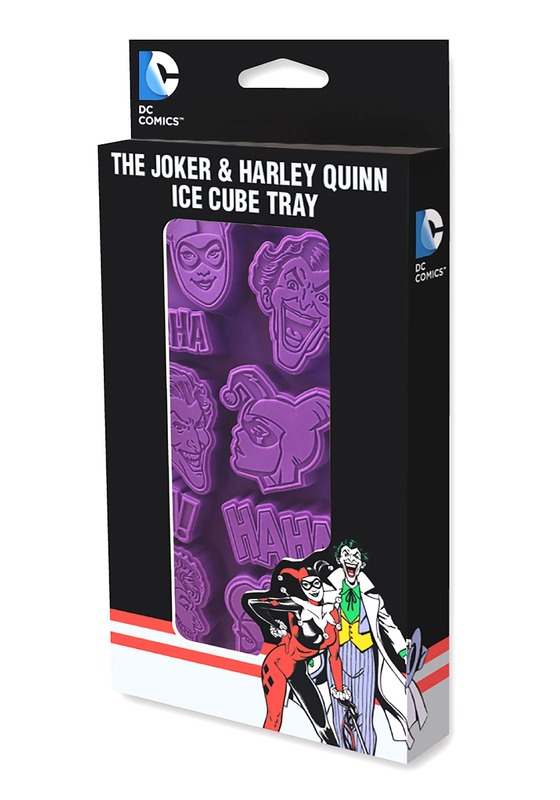 Remember, don't place them in the microwave, dishwasher or hot water and you'll have these Joker and Harley ice cubes forever! Your drink is all dressed up and ready for consumption, but you aren't dressed up yet! Sip your cocktail in a Harley Quinn or The Joker costume to get the full effect. Or, you could also throw a Batman-inspired party and serve drinks using these ice cubes.